KUSA Ethernet Switch KY-CSV3170EM - J.O. Herbert Co., Inc. The KY-3170 Traffic/ITS Ethernet switch packs a powerful set of features into an industry-standard 4-channel vehicle detector form factor. 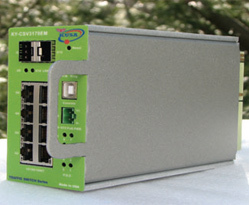 This “Green Ethernet” switch uses an astonishingly low fifteen watts or less, allowing it to be hot-plugged into any CalTrans input file (or NEMA TS 1/TS 2 detector rack) for rapid and reliable field placement. Certified for HD Video deployment Quick installation in the input file/detector rack eliminates the unreliability of external power supplies, the problem of finding filtered AC power within the cabinet, and the difficulty of a clean physical installation in today’s crowded traffic cabinets. As the premier unit in the Traffic/ITS line of products, the managed KY-CSV3170EM is perfect for the deployment of video surveillance, controller communications, DMS signs, and other Traffic/ITS applications. The KY-CSV3170EM is the ideal Multicast Switch specializing in video applications. Power Over Ethernet ports upgradeable (4 or 8 port) by adding daughter cards.